← 5 days until The Giant’s Shoulders #27! With all the concerted efforts into popularizing science that goes on these days, it is quite easy to forget that some of the best scientists throughout history put a lot of effort into making their knowledge accessible both to students of the arts and laypeople alike. Physicists in particular are often viewed as “keepers of secret knowledge” who study phenomena outside the ken of mortals and who are unwilling or unable to make this knowledge accessible to others. A perfect counterexample to this perception is the great physicist Michael Faraday (1791-1867) , who over the course of many years presented the Christmas Lectures at the Royal Institution, targeted at nonspecialists and young people. Two of these lectures, “The Forces of Matter” and “The Chemical History of a Candle”, have been reprinted and are still available today; I will be blogging about them in detail in the near future (hopefully). Faraday in fact put much effort and thought into his public presentations; long before he was a recognized scientist and had any opportunity to speak to an audience, he observed other lecturers and took elaborate notes on the “do’s” and “don’t’s” of lecturing. Another example of a distinguished scientist working very hard on presentation is Robert Williams Wood (1868-1955). 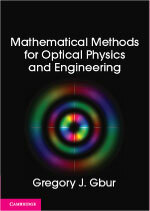 Wood is best known today for his work in optics, particularly in the study of infrared and ultraviolet light. As we have seen previously on this blog, however, Wood was also active in popularizing science: he co-authored two science fiction novels, The Man Who Rocked the Earth (1915) and The Moon Maker (1916). He also was quite skilled at setting up simple demonstrations of optical effects; I’ve previously discussed his 1902 illustration of a simple form of invisibility. Between the years 1897 and 1905, Wood in fact published a number of short articles suggesting simple lecture hall demonstrations of a variety of physical phenomena; in this post, we’ll take a short look at these demonstrations. Wood’s publications all appeared in what was at the time a still a young and undistinguished journal, the Physical Review. Founded in 1893, it was managed through Cornell University until 1913, at which time the very young (found. 1899) American Physical Society took over. 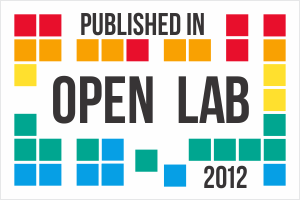 Today the Physical Review extends over 5 simultaneously published series (A-E), not counting the top physics-only letters journal, Physical Review Letters, and the collection is the main publication outlet for physics. In the early years of the 20th century, however, the most important physics journals published in English were the Philosophical Magazine and the Philosophical Transactions of the Royal Society. Truly important results would appear in those journals first, and Physical Review was a second or third tier journal to which authors relegated their incremental and pedagogical discoveries. A number of authors contributed suggested lecture demonstrations, but none was as productive as Wood, who by my count published 5 demonstrates between 1897 and 1905, with at least one more in the 1920s. The ideas are simple and ingenious, though in one case not without controversy, as we will see. We consider them, with one exception, in order of their publication. In treating of the Doppler effect in the class room, it is usual to cite the example of the change in the pitch of a locomotive whistle in rapid motion. As a matter of fact scarcely one person in ten has any distinct recollection of ever having noticed the phenomenon, unless his attention has been directed to it, and it may be of interest to teachers to know that it can be shown by means of a very simple and inexpensive piece of apparatus. A small pitch pipe such as is used by musicians is securely fastened to the end of a tapering stick six or seven feet long, such as a blackboard pointer. This can be blow with a piece of rubber tubing fastened along the rod, and by waving the device rapidly, it is possible to give the sounding pipe a to-and-fro velocity of twenty or thirty feet a second, which is sufficient to cause a marked rise and fall in the pitch. By waving the stick first in the direction of the “line-of-sight,” and then at right angles to it, it can be shown that the effect occurs only in the former case. A bamboo fish pole with the partitions bored out, the pipe fastened into the tip by means of sealing wax, and a short piece of rubber hose inserted near the breach, would make a less clumsy piece of apparatus. This is such an easy experiment that I’m tempted to try it! Apparatus for Illustrating Potential Gradient, Phys. Rev. (Series I) 6, 164 (1898). An important concept for beginning physicists to grasp is the idea of potential energy and the related concept of potential. In short, physics broadly divides energy into the energy of motion (kinetic energy) and “stored” energy (potential energy). The simplest example of potential energy is gravitational potential energy — when a person climbs a hill he expends his own body’s energy and creates gravitational potential energy, which is then rereleased as kinetic energy if he runs down the hill or rides a bicycle down it. Closely related to potential energy is the “potential”, which is a quantity connected to the observation that everyone gains/loses energy in the same manner in climbing/descending the hill. The “potential” is a mathematical representation of this gain/loss of energy that is independent of the specific observer involved in the climb — “potential energy” is associated with the person, while “potential” is associated with the hill itself. A glass tube of 1 cm. bore, about .5 meters long, is provided with 8 lateral tubes, each about 40 cms. long and 4 mm. in diameter. A small roll of wire gauze is pushed into the tube until it is midway between the 2d and 3d side tubes, close to the latter. The tube is now filled with coarse shot (about No 1) nearly up to the 6th tube and the rest of the way with fine shot (No. 8), a plug of gauze being inserted to prevent their exit. The gauze rolls must be very open, so as to offer little resistance to the flow. The empty end of the tube is connected by a rubber hose with a funnel or other reservoir, and a short piece of hose is slipped over the other end. The lateral tubes are open, and the height of water in them is dictated by the pressure of water at that point in the horizontal tube, which is in turn comparable to the “potential” of the fluid system. In the region of fine No. 8 shot, there is a high “resistance” to fluid flow, which corresponds to a small change in potential. In the region of coarse shot, there is lower resistance, and a steeper change in potential. Finally, past the gauze the fluid flows unobstructed and the potential drops rapidly to zero; this progression is illustrated by the dashed line in the figure. This system is comparable to an electrical system. The “current” is the flow of water through the tube, just like electrical current is the flow of electrons. The “resistance” is provided by the shot, which impedes the flow of water, and the “potential” is directly related to the pressure in the tube, measured by the height of water in the lateral tubes. If the flow of water is blocked by plugging the (left) outflow to the tube, the pressure will equalize, and there will be a uniform “potential” through the tube. This system is a nice, simple way to visualize the potential change along a conductor of varying resistance. The bulbs are mounted on a wooden rod with brass strips, and a little ether introduced into the inner bulbs by means of a pipette drawn out in to a very fine capillary. 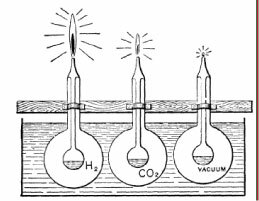 On immersing the apparatus in scalding hot water, until the large bulbs are covered, the ether is vaporized at rates depending on the rate at which heat is fed across the space intervening between the outer shell and the inner bulb. In about half a minute the jet of ether vapor from the hydrogen bulb, can be lighted burning with a flame about 4 cms. in height. The second jet lights about fifteen seconds later, and burns with a much smaller flame, while the jet from the exhausted bulb does not ignite till the lapse of another half minute, and the flame is so small that it is almost invisible. 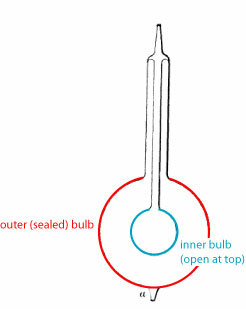 The heat from the water bath is conducted (or not) by the material within the outer bulb to the ether within the inner one; this heat vaporizes the ether, causing an increased flow of it out of the open tip of the inner bulb. The amount of outward flow is directly related to the amount of heat conducted to the inner bulb; hydrogen conducts the most, while the vacuum conducts essentially no heat at all. The flames ignites on the tops of the bulb give a visual representation of the ether flow and therefore the conductivity of the various gases. Not remembering to have seen any attempt to show experimentally in the lecture room the motion of bodies acted on by a central attractive force varying inversely as the square of the distance in elliptic, parabolic, and hyperbolic orbits, I have mad e a few experiments with a view of determining how well these curves could be imitated by the motion of a small steel ball around a magnetic pole. The results were so good that I feel warranted in making them known, and believe that the experiment may be found useful in making more cheerful that portion of the course usually rather destitute of pyrotechnics. From this inverse square law, one can show that the planets follow elliptical paths around the Sun, and can show that in general objects moving under the influence of an “inverse square law” travel in either elliptic, hyperbolic, or parabolic paths. 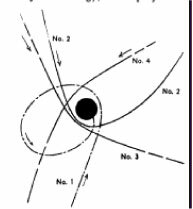 By what one may call a happy coincidence, the force between two electrical charges or two permanent magnets also satisfies an inverse square law; one can in principle, then, simulate gravitational motion using electrically or magnetically active materials. The apparatus used was very simple, consisting of a circular glass plate about 40 cm. in diameter, with a small hole in the center through which projected the somewhat conical pole piece of a large electro-magnet. The surface of the plate was smoked, and it was made level as nearly as possible, the axis of the magnet being of course vertical. A small, highly polished ball of steel about 5 mm. in diameter (from a bicycle bearing), when projected across the plate, traced its path in the soot and left a permanent record of its motion. Path No. 1 exhibits nearly elliptical motion, though friction on the tabletop causes the bearing to “fall into the Sun” before a single revolution is completed. Path No. 2 looks somewhat parabolic, at least during its second half, while paths No. 3 and 4 are hyperbolic. The idea seems like a very clever one, except for one major problem: the system does not in general satisfy an inverse square law! I noted above that a pair of permanent magnets will satisfy an inverse square law, but the steel ball being used actually has its magnetism induced in it by the central electromagnet. This is a paramagnetic response, as I discussed in a previous post, and the law of attraction between the electromagnet and the ball in general goes as the inverse fifth power of the distance, i.e. Under such a condition, one would not expect the ball to follow elliptic, parabolic or hyperbolic paths, and apparently a number of scientists criticized Wood in print for this oversight. Another concern addressed in the articles is the ferromagnetic nature of the steel ball! The ball can have a permanent magnetic moment induced in it by the electromagnet, which results in a repulsive force between the two, and making the demonstration inaccurate. Apparatus to Illustrate the Pressure of Sound Waves, Phys. Rev. (Series I) 20, 113 (1905). Like all physical waves, sound waves carry momentum and can impart this momentum onto other objects. If you’ve ever been to a big rock concert you’ve no doubt experienced this momentum yourself, as the music beats against your skin. Instead of going for big noises, Wood went a different route and showed that focused sound waves could in fact turn a (very small) wheel! A spark gap generator produces a rapid series of noisy electrical sparks. The sound waves from those sparks are reflected and concentrated to a point by a concave spherical mirror. At the focal point is placed a very lightweight structure very much like a mill wheel (or weather vane), constructed out of aluminum foil and thin vanes of mica. The concentration of the sound waves on one side of this vane causes it to turn; by moving the mirror slightly the motion can be stopped or even reversed. Wood seems to have turned his eye to more scientific research after the publication of his demonstration on sound waves, though at least one more lecture demonstration was suggested in a paper in the 1920s. As the Physical Review grew in popularity and prestige, less of these types of articles appeared and relatively quickly they disappeared almost entirely. Today, ideas for classroom demonstrations are usually published in journals that specialize in pedagogical discussions, such as the American Journal of Physics. Furthermore, with the standardizing of physics education and the advent of companies that sell pre-packaged demonstration equipment, there is not as much demand for novel lecture techniques as there once was.